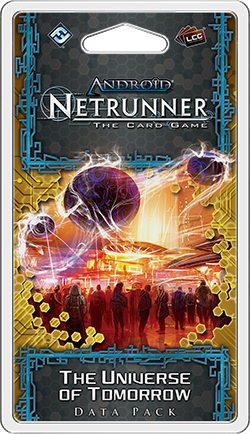 Fantasy Flight Games is proud to announce the upcoming release of The Universe of Tomorrow, the sixth and final Data Pack in the SanSan Cycle for Android: Netrunner! What do the world's largest and wealthiest megacorps have cooking in their R&D departments? You don't need to run to find out. All their latest projects are on display at the Universe of Tomorrow! 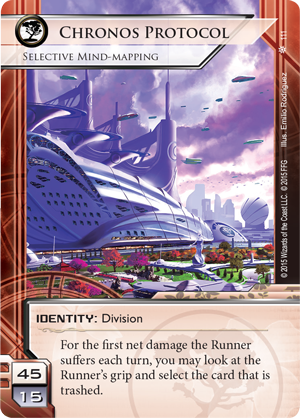 The sixty cards of The Universe of Tomorrow (three copies each of twenty different cards) transport you to the expo's plazas and pavilions, where all the major players are eager to unveil their latest innovations. While Haas-Bioroid shows off its newest cybernetics at the Cybernetics Court and NBN pitches new products in Franchise City, you'll find Jinteki showing off its work at the Genetics Pavilion and the Weyland Consortium garnering public support for its newest initiatives at the Worlds Plaza. In addition to a wealth of glittering displays and new technologies, The Universe of Tomorrow also contains two future-focused identities. First revealed to the public during the Plugged-in Tour, and selected for inclusion in the game by the tour's players, Laramy Fisk (The Universe of Tomorrow, 104) has earned nearly as much fame for his rapid rise in the investment world as he has for his bleeding-edge fashion sense and the women he's dated. Surprisingly, at the root of all Fisk's success lies his sense of subtlety. It's not what you'd expect of a man who regularly headlined the dailies while romancing troubled starlet Miranda Rhapsody, but the glamor and and flashing lights may all just be part of a carefully calculated con game. 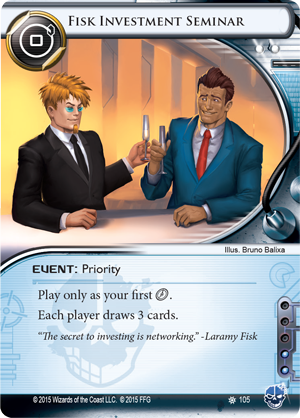 As a Runner and investor, Fisk has learned how to seize the right moment to make his move, and his ability reflects this, “The first time you make a successful run on a central server each turn, you may force the Corp to draw 1 card.” It's an ability that, at first, seems to benefit the Corp as much as Fisk, and that's how Fisk likes it. After all, if his Corporate customers are happy with his work, they're more likely to return. Furthermore, it's through this networking and this contact with his customers that Laramy Fisk is able to gain much of the insider information upon which his success has been established. It's not just summaries of corporate assets and targeted acquisitions that matter, however, and Fisk is always on the lookout for people with more access to sensitive information. You can never be certain when a "friend" will be happy to invite you into an office with local access to Corporate networks or when you'll meet some drunk braggard who can be easily coerced into sharing stories of possible corporate mergers. 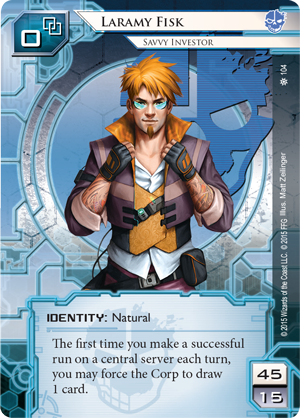 The second of the Data Pack's new identities is Chronos Protocol (The Universe of Tomorrow, 111), to which Jinteki won access during the Chronos Protocol Tour. It's easy to see why Jinteki players would be eager to play with an identity that allows them to use their net damage to erase cards from the Runner's hand with surgical accuracy, but in order to win the rights to utilize the Chronos Protocol's boundary-breaking mind-mapping techniques, Jinteki had to outmatch the overtly aggressive bid made by competitor Haas-Bioroid. Now, they aim to start reaping the benefits from their investments. 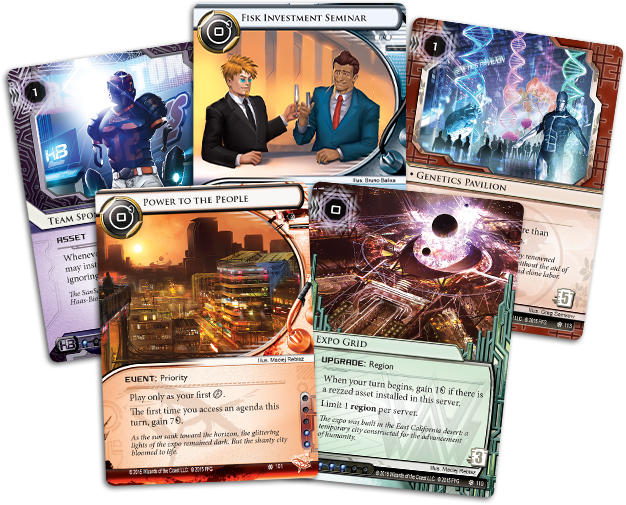 Thus, like Laramy Fisk, Jinteki's Chronos Protocol arrives in The Universe of Tomorrow with some complementary cards. 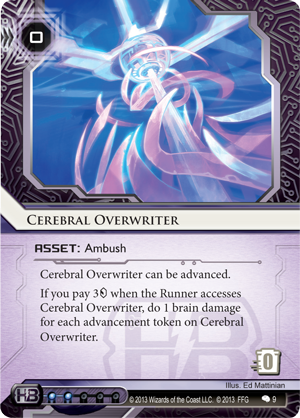 The first is the agenda Ancestral Imager (The Universe of Tomorrow, 112), which deals one net damage whenever the Runner jacks out of a run. Although Runners don't commonly jack out of runs, if any Corp has the tools to get them to second guess themselves, it's Jinteki. 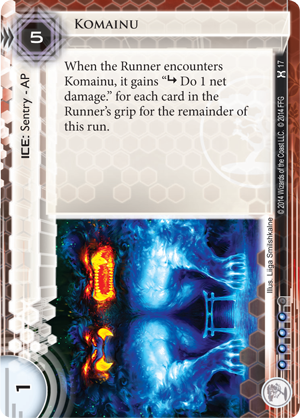 Rez a Chum (Core Set, 75) in front of another layer of ice, and the Runner may very well opt to let you choose a card to rip out of his hand, rather than face the possibility of a boosted Komainu (Honor and Profit, 17). Alternatively, you can install and double-advance a card in a server protected by one or more layers of ice. 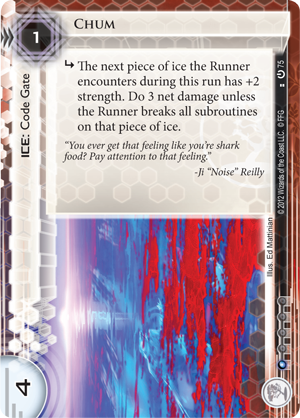 Then, when the Runner runs on that server and you've got the credits you need to rez any meaningful ice, you can simply let the Runner through. 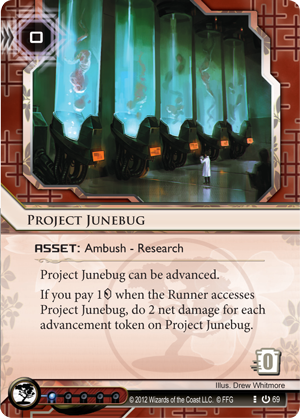 Is it a Project Junebug (Core Set, 69) or a Cerebral Overwriter (Creation and Control, 9), or is it just a bluff? It doesn't necessarily matter when you're running Chronos Protocol with Ancestral Imager on the table; either way, you force the Runner into the sticky decision of facechecking a likely ambush or having a card selectively removed from his hand when he jacks out. 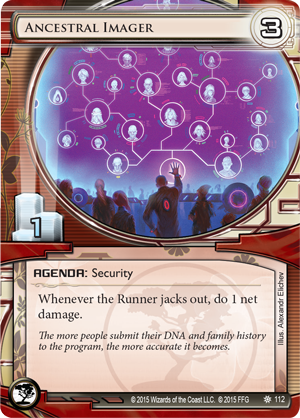 The second card that Jinteki gains in The Universe of Tomorrow to complement its Chronos Protocol division is the Genetics Pavilion (The Universe of Tomorrow, 113), which prevents the Runner from drawing more than two cards. As any experienced Runner can tell you, this effect is a terrifying inclusion to any Jinteki net damage deck, and once you rez it, the Runner will immediately target it for destruction. Still, even then, it plays an effective role; at the cost of just one to rez and five to trash, the Genetics Pavilion plays toward your economic superiority. 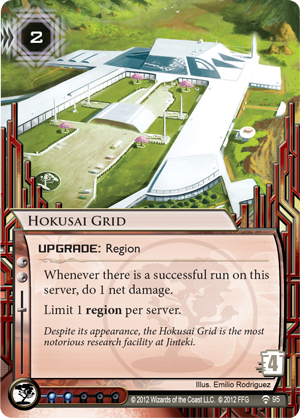 Additionally, because it's a ritzy facility instead of a Region, you can play it into the same server as your Hokusai Grid (Humanity's Shadow, 95) to gain a targeted net damage. 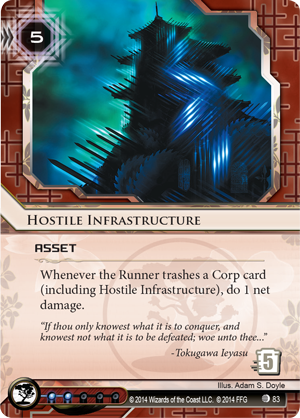 Of course, if you're able to deal targeted net damage at will, you might also play Hostile Infrastructure (All That Remains, 83) into another server, and when the Runner decides to trash your Genetics Pavilion, it will cost him five credits and two net damage, one of which is doomed to strip away the best card from his hand. With its two new identities, The Universe of Tomorrow offers you plenty of new ways to invest in tomorrow's cyberstruggles. Business is booming at the expo, and the game's megacorps are all proudly displaying their latest designs. 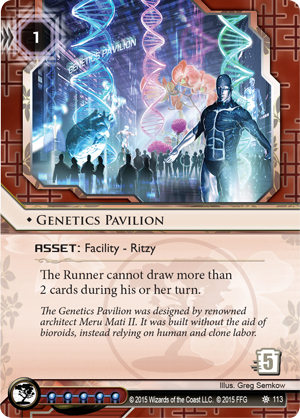 Jinteki's Genetics Pavilion is just one of four new five-influence assets, and Fisk's Investment Seminar is just one of the ways that the game's Runners look to take advantage of the expo's tech and teeming masses. How will you harness the designs of tomorrow? The future is yours to explore when The Universe of Tomorrow arrives at retailers in the third quarter of 2015!